Heber City -- Starting immediately, you must decontaminate your boat before you leave Deer Creek Reservoir in north-central Utah. The requirement comes after DNA tests conducted by two laboratories found microscopic juvenile quagga mussels�called veligers�in a water sample taken at the reservoir. 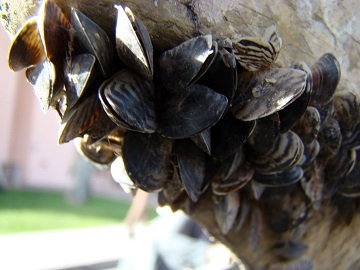 Jordan Nielson, aquatic invasive species coordinator for the Division of Wildlife Resources, says the discovery does not mean Deer Creek Reservoir is infested with quagga mussels. "We've found veligers in the past at other waters in Utah," he says. "With the exception of Lake Powell, mussel populations never established themselves in the waters where veligers were found. We're hoping that will be the case at Deer Creek too." Nielson says quagga mussels usually do not reproduce in water that's colder than 50 degrees, so�even if there are adult mussels in the reservoir�there's currently little risk of the population expanding. That could change, though, once the water starts to warm in the spring. Clean and drain their boat, on their own. After cleaning and draining, a DWR or Utah State Park technician will place a tag on the boat that indicates when it was cleaned and drained. The boat will not be allowed to launch at another body of water in Utah until the boat has dried long enough to kill any mussels that might be in or on it. In the winter, boats must dry for at least 30 days. The drying time can be as little as three days, though, if the temperature the boat is drying in remains below 32 degrees Fahrenheit for at least 72 straight hours. Have their boat professionally decontaminated. The service is free. A DWR or Utah State Parks technician will determine whether the boat needs to be professionally decontaminated. Nielson says the presence of veligers in the reservoir does not mean a quagga mussel population has established itself there. "To establish itself," he says, "a quagga population needs adult mussels." Which raises a question: if there aren't any adult mussels in the reservoir, where did the juvenile mussels come from? "This could be an isolated incident," Nielson says. "For example, it's possible that the veligers made their way to the reservoir in or on a boat that had been on a contaminated water. We'll know a lot more after we and our partners conduct further surveys this spring." Collecting and analyzing water samples. Sending divers into the reservoir, to search for mussels. Placing substrate samplers in the water. Adult quaggas attach to these as they move through the water. Water from the reservoir flows into the lower Provo River and then into Utah Lake. Nielson says quagga mussel sampling work has been underway at Utah Lake for years. "The sampling work will continue in 2015," he says. Starting this spring, biologists will also sample the lower Provo River. Nielson says the middle Provo River, the section between Jordanelle and Deer Creek reservoirs, is less at risk. "Quaggas can't move upstream," he says. "The only way they could make their way to the middle Provo River is if they were transported there on someone's boots or fishing equipment."